3 nights stay in Panorama room with balcony and lake view. 2 entrances of 90 minutes per person to Poiano La Spa Wellness Path (salt lagoon, sauna, hammam, emotional showers) by appointment. Kit Spa (bathrobe, towel, slippers). 1 Sport Massage of 30 minutes per person. 30% discount on massages and treatments. 1 green per person at Golf Club Franciacorta (BS) and at Golf Club Paradiso (VR). Package price: from € 213 per person. Credit card guarantee, payment in hotel. Cancellations: no fee due if made 7 days or more prior to date of arrival, fee of 30% of total cost of stay (charged to credit card) if made 6 days or less prior to date of arrival. A break for two on Lake Garda. Wellness weekend with the magical backdrop of Lake Garda. An Easter for two in absolute relax. Everything Golf on Garda Lake. 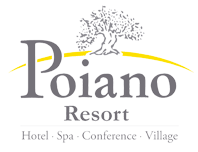 Celebrate your birthday at Poiano Resort! Relaxing and fun mini vacation surrounded by nature.